Some strokes that make up Chinese characters are very important, drawing them just a bit too long or with the wrong angle will change the meaning of a character completely. Other strokes are not so sensitive and writing them incorrectly will just make the resulting character ugly. Below, I have created a quiz with 14 similarly looking characters that differ only in the length or slope of one stroke. See how many you know! If you have any suggestions of more pairs or triplets, please leave a comment! Here are the answers, but do make an effort before you peek! How did it go? If you’re a beginner, don’t be too discouraged by this, these really are some of the trickiest cases. If you’re an intermediate learner, you should know at least half. Advanced learners should get all or almost all of them! Learning to separate characters like these requires what I call horizontal vocabulary learning, which means that you can’t just drill down (look at character components) or go higher up in the hierarchy (looking at what characters and words a character appears in), you have to look at similar characters at the same level as well. This requires focused studying, even if it can of course be accomplished by a very large amount of exposure as well. Before I round this article off, though, I want to share with you a game I usually play with the students when I teach beginner courses in Chinese. The idea of this game is to show the students how quickly they go from viewing Chinese characters as pretty pictures to regarding them as symbols with a structure that is part of a larger writing system. The game is based on a well-known game, which is rather suitably called Chinese whispers. The original idea is that one person starts with phrase, then whispers it to the next person, who then whispers it to the third and so on until the message reaches the last person, who says the words aloud. The message is usually hilariously corrupted by this time, which is the point of the game. 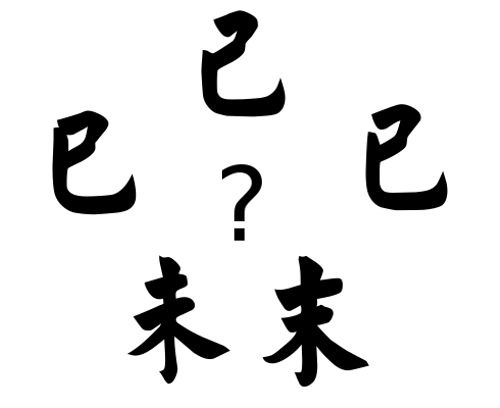 In this Chinese character variant, the first student doesn’t whisper words, he or she writes characters on paper and sends them to the next, who then copies the character on a new piece of paper and sends the copy on. After passing ten students or so, most of the original characters are completely unreadable for the teacher. The reason is simple. They don’t know what matters. They think they’re copying accurately, but they focus on the wrong things. They think a certain feature is important, but in fact it isn’t. They underestimate the spacing of the components and the length of strokes. The interesting thing is that when I play the same game with them a week later, after teaching the basics of Chinese characters, all teams can easily copy the characters ten times without corrupting them beyond recognition. It also takes about half the time it takes the first time around.